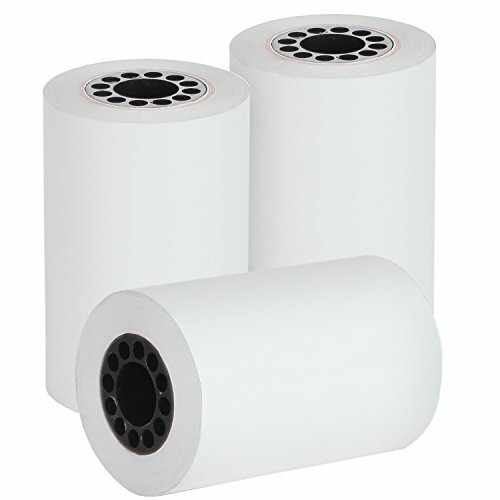 Our thermal paper is made with the highest quality 48GSM thermal paper. This paper fits: Axalto Magic X1000 Blue Bamboo Model P25 Portable Printer Blue Bamboo Model H50 Wirelss POS Terminal Celerex CX 1000 Remote Terminal Citizen CBM262, CBM270 EBW Auto Stik 950 EMCO/Wheaton Tank Monitor II Extech S1500T, S2500THS First Data FD400 Credit Card Terminal Hypercom I.C.E.4000, Hypercom I.C.E.4000CE, Hypercom I.C.E.5000, Hypercom I.C.E.5500, Hypercom I.C.E.6500 Hypercom T7P-T Ingenico iCT200, Ingenico iCT 220, Ingenico iCT250, Ingenico iWL255, Ingenico iWL252, Ingenico BIO930, Ingenico EFT930 Series, Ingenico EFT930S-L, Ingenico EFT930S, Ingenico EFT930S LinkPack 3000, 9000, 9100 MagIC 6000 Match CONSULT-II Nissan Monitor Nurit 2080, Nurit 2085, Nurit 2090, Nurit 3000, Nurit 3010, Nurit 3020, Nurit 5000, Nurit 504, Nurit 505, Nurit 8000, Nurit 8320 Omni 3200, Omni 3210, Omni 3300, Omni 3730, Omni 3740, Omni 3750 Omniprint J.C. 1160 Series, OM20 Oneil 2t, 2te Printek Mt2 Royal Alpha 583CX, Royal Alpha 600SC, Royal Alpha 9155SC Samsung ER5200, ER5240, STP-103, STP-131 Schlumberger MagIC 6000, MPT/ICC SII Sharp 01PU, 01PU, XE-A201 Standard Register S40 Talento Dassault Veeder Root TLS350 Verifone Omni 3200, Omni 3210, Omni 3300, Omni 3350, Omni 3740, Omni 3750, Printer 350, Printer 355, Printer Tranz 420, (Verifone part #CRM0027), Verifone Vx510, Vx520, Vx570, Vx610 Vx810 Duet, Vx820 Duet And many more! 5 year image life. Top quality 48GSM paper.